The Red Hat Single Sign-On Server is contained in one distribution file: rh-sso-7.2.6.GA.zip.gz. The rh-sso-7.2.6.GA.zip.gz archive is the server-only distribution. It contains only the scripts and binaries to run Red Hat Single Sign-On Server. 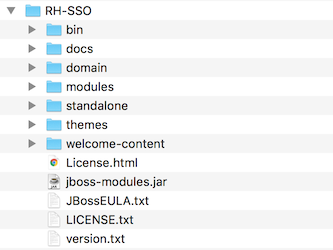 You must subscribe to both the JBoss EAP 7.1 and RH-SSO 7.2 repositories before you can install RH-SSO from an RPM. You cannot continue to receive upgrades to EAP RPMs but stop receiving updates for RH-SSO. Using Red Hat Subscription Manager, subscribe to the JBoss EAP 7.1 repository using the following command. Replace <RHEL_VERSION> with either 6 or 7 depending on your Red Hat Enterprise Linux version. Ensure that you have already subscribed to the JBoss EAP 7.1 repository. For more information see Subscribing to the JBoss EAP 7.1 repository. Using Red Hat Subscription Manager, subscribe to the RH-SSO 7.2 repository using the following command. Replace <RHEL_VERSION> with either 6 or 7 depending on your Red Hat Enterprise Linux version.